Peanut Butter Cookies with Dark Chocolate Surprise! Peanut Butter Cookies are delicious, chocolate is delicious. Put both together and these cookies are out of this world. 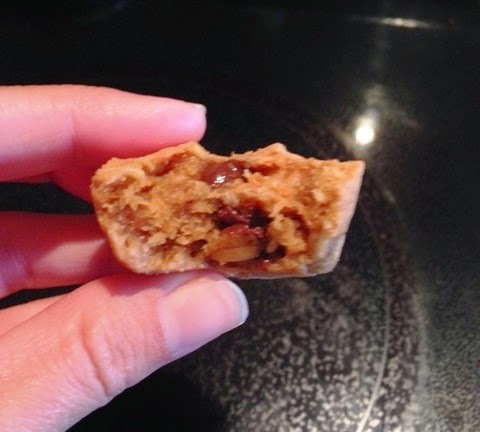 Gooey, yummy, and complete with a glass of (dairy-free) milk Oh yes and did I mention they are only 2 Grams of Sugar and 5 Net carbs?! Mix the first four ingredients well. WARNING: Mixture will be sticky, I just let my hands get dirty. I’ll edit this post if I ever think of a cleaner way to prepare these. Grab a handful of dough and start to mix into a ball. Grab 1/4 of one Dove Dark Chocolate and stuff into the middle of the dough ball. Put into one mini muffin tin and flatten to the edges so it is more of a cookie, less of a ball shape. Repeat process until all mini muffin tins are full and ingredients are used. Bake on 325 for about 5 minutes, then rotate pan to ensure even cooking. Continue to bake for about 5 more minutes. Pull out pan and allow cookies to cool, use a spoon to pop out onto a cooling tray if needed.